Healthy Cookie Blondies — Welcome to Fitty Foodlicious! Cookie blondies sounded really good, but I wanted to make them healthy. So I decided to film a healthy cookie brownie recipe, totally improvised, hoping they would turn out good. And guess what? They turned out great! Better than I had expected. I used only ingredients I already had in my pantry as I wanted this recipe to be something people could easily do on a whim like I did! With simple ingredients and stuff you most likely already have in your pantry, these cookie blondies are super easy and fun to make. For this recipe, you will need melted coconut oil that has been brought to room temperature. Don't add the coconut oil right after you've melted it or it will cook the egg. I used sunflower seed butter in this recipe because it's my favorite, but you can use any nut butter you prefer. Peanut butter is another great option! I also used almond flour in this recipe but I also tested this recipe with regular flour and they work exactly the same. If you are gluten-free go the almond four route! I used semi-sweet baking chocolate chips and these are my go-to's. If you prefer you can use white chocolate chips, but I highly recommend using semi-sweet chocolate chips for a rich, chocolatey taste. 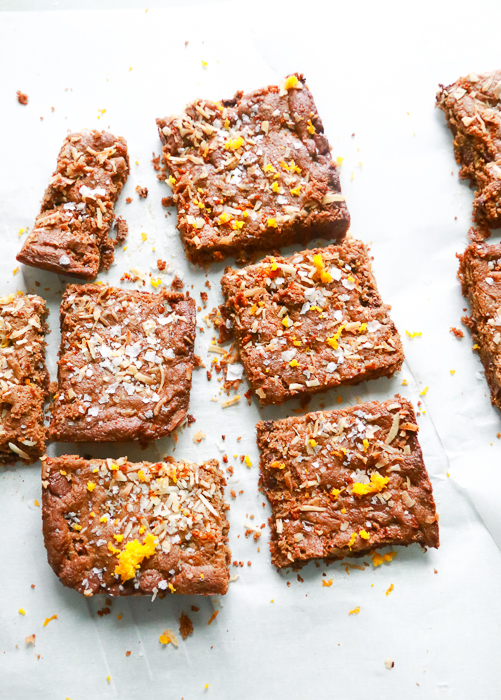 I also added orange zest to these cookie blondies and it made all the difference in the world. 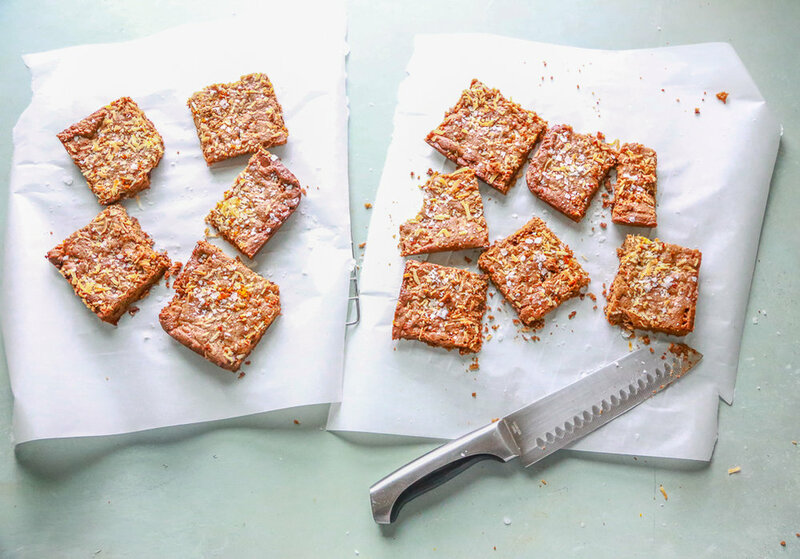 I used a Cara-Cara orange for my orange zest and it just makes these blondies bright and happy and gives them a refreshing taste! You could also opt for lemon zest which would be super delicious too or do a combo of both. 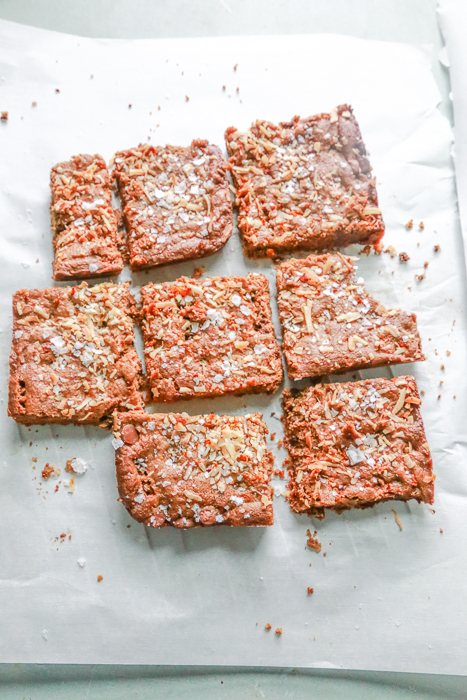 You can whatever toppings you like, like hemp hearts or cacao powder, but I love the crunch the shredded coconut gives these so that's what I did. Side note: I also added chunky sea-salt to the tops of these and I highly recomend doing that, it make them so tasty with the chocoalte chips. Like a chocolate chip sea-salt cookie! If you guys make these cookie blondies, please tag me in your photos on Instagram, because I want to see! The cookie blondies taste amazing and you'd never know they are gluten-free and made without any refined sugars. Enjoy! Preheat oven to 350-degrees and greased a baking pan with coconut oil, set aside. 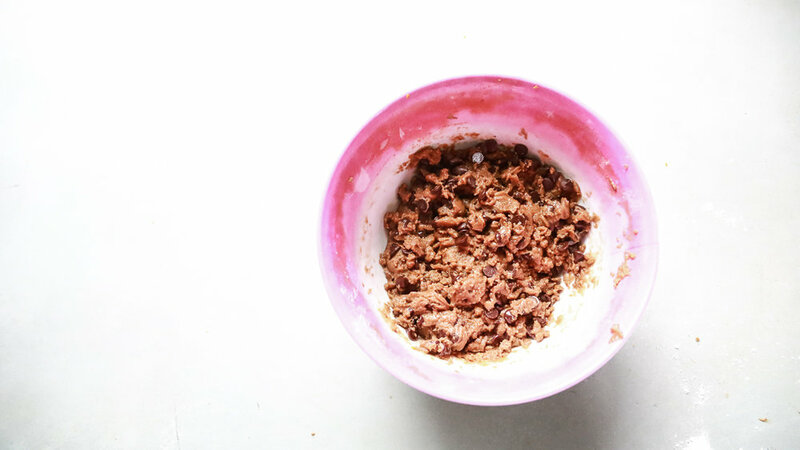 In a large mixing bowl, whisk together melted coconut oil, sunflower seed butter, vanilla extract, and coconut sugar.Next, add the almond flour and sea salt and combine again. Add some orange zest, the chocolate chips, and combine. Next, spread the cookie blondie mixture on a greased baking pan and spreadly evenly. Next, add more orange zest and shredded coconut to the top. Bake at 350-degrees for 15-20 minutes or until browned.